Summon: Give other friendly Skeletons +1/+1. Skeleton Champion is an epic Endurance creature card. It is part of the Houses of Morrowind expansion. This card's summon ability applies the Championed card effect. 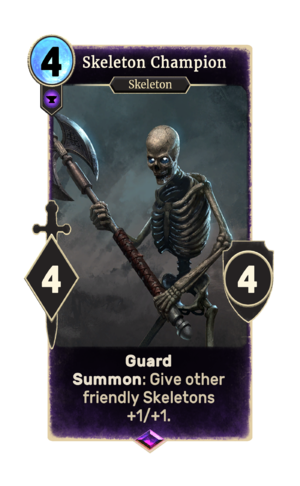 Skeleton Champions first appeared in Morrowind and later appeared again in Oblivion. This page was last modified on 24 September 2018, at 23:18.